In my hometown, Summer Solstice is a great grand affair. There’s a crazy parade with open entry, an annual theme and floats and stilts and bikes and trikes and costumes and ART, everywhere. It draws all kinds of people, and the little ones run wild like tiny face-painted gremlins, while the last of the old hippie enclave strip to their skivvies and dance around like big body-painted bohemians. What a party! Imagine my surprise when I realized that this was just a regional thing. Or maybe just an aged hippie thing (big ups to all my parents!) Most people, in fact, do not even celebrate the longest day of the year. What a shame! This year, we kicked off the first day of summer with our first official BBQ. I wanted to try something different, and decided to dust off that old bottle of mezcal. 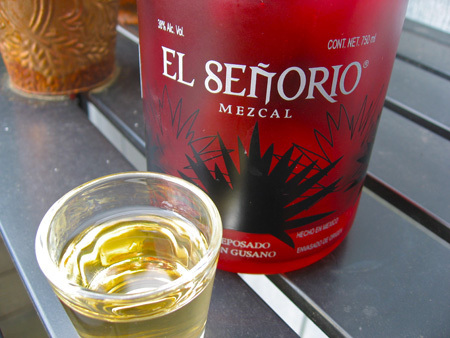 Mezcal is related to tequila, but is derived from various agave plants. Tequila is solely a product of Blue Agave. But mezcal has a distinctly smokey flavor, and it’s amazing and smooth and mild and it makes a totally mean margarita. 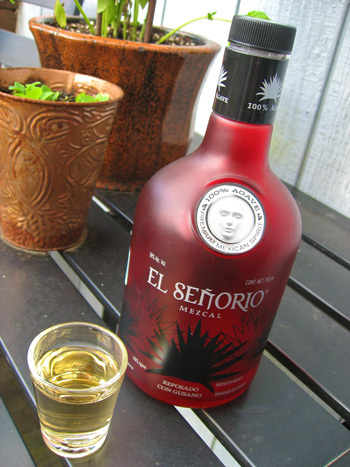 I absolutely adore this liquor, and I brought back as much as I could from my honeymoon in Mexico! With it’s seriously smokey flavor, mezcal just seems suited for grilling. And what better way to offset the the intensity of agave liquor, than the sweetness of agave syrup? The result was perfect synergy. That there drink is a watermelon daiquiri, also highly recommended! First things first, make a mezcal margarita. 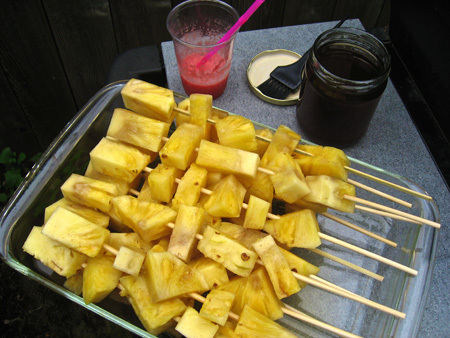 Next, soak ~15 bamboo skewers, an hour at least, so they won’t burn on the grill. Combine the mezcal, agave, vanilla, and cinnamon in a glass jar with a lid. Shakey shakey shakey (it helps to do a little dance). Grill those suckers! Braise them frequently and rotate as well. 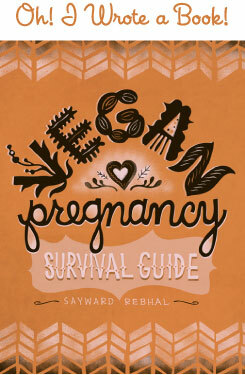 Try to use up all of that mezcal mixture. They’re done when they darken and soften, but you should taste them to test. Keep tasting. Mmmm, yeah. Taste MORE! And have another mezcal margarita. To summer! Hey there. I ran across your site on lifehacker.com (baking soda drain cleaner). Genius idea. I love your site. 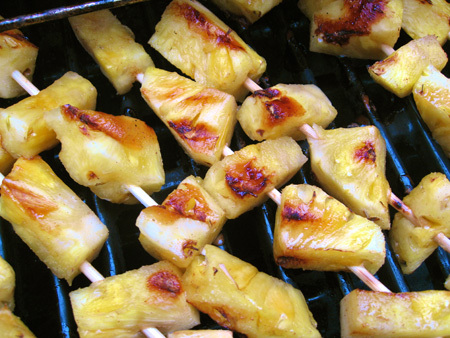 And I just have to try your mezcal grilled pineapple recipe including the mezcal magarita (I’m thinking strawberry and mango). 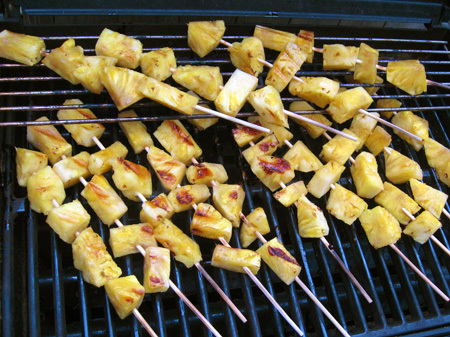 that said, I don’t know how much would marinating the pineapple would help to boost the flavor. If I had to suggest something to boost the flavor, I would say sprinkle a little salt… whenever using fruit, you should always use a tiny amount of salt anyways as it brings out the natural sweetness of fruit. @ Katie – I think EroSan is exactly right. The marinade wouldn’t change the texture – but it also probably wouldn’t add too much flavor. But it wouldn’t hurt, so if you wanted to make it all up ahead of time for convenience, I say go for it. Let me know how you like the recipe, if you try it! Whoops, missed this comment, sorry! I’m from Santa Barbara California!